Candied oranges dipped in chocolate are an easy and tasty sweet treat perfect for the Holidays. 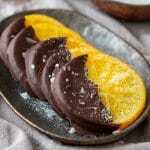 Omit the chocolate and use the slices for decorating cakes, cupcakes or quick breads! Wash the orange thoroughly under running water and cut into thin slices (no more than ¼ inch/0.5 cm). In a large wide-bottomed pot heat the water and sugar until the sugar has dissolved. Add the orange slices and spread them around making sure they don’t cover each other completely, if possible (they will shrink slightly during simmering so don’t worry if they are overlapping a bit). Simmer on low heat for 40 minutes, turning them occasionally. When ready, transfer the slices onto a wire rack and let them cool completely. To speed up the cooling process you can place them in the fridge for 10-15 minutes (or 10 mins fridge + 5 mins freezer). To cover the slices in chocolate: Melt the chocolate over a pot of simmering water. Dip half of each slice in chocolate and place them onto a tray/chopping board lined with a sheet of aluminum foil. Transfer them into the fridge or leave in a cool place until they harden completely. This will take about an hour. Use 1 large or 2 small oranges. Use a wide-bottomed pot to simmer the orange slices in. I use either a 10 inch or 8-inch pan (25cm or 21cm). I used dark chocolate (70% cocoa content) but you can use semi-sweet chocolate as well. Salt flakes are completely optional. A great substitution is dried lavender or cake sprinkles. In this recipe dry measuring cups were also used for measuring liquids. When simmering the oranges, leave the lid on. Do not boil them. Boiling will turn the syrup into caramel. Store them in an air-tight container in the fridge. For tips and more detailed explanation I recommend reading the full post.